Word has been received of the death of Tom McDonald, who served as an elder at Grace Brethrn churches in North Long Beach, Calif., and Pataskala, Ohio. He also supervised the construction of the gymnasium at the former Grace Brethren Navajo Mission in Counselor, N.M. One of his sons is Grace Brethren pastor, Fenton McDonald. Ton’s obituary appears below. 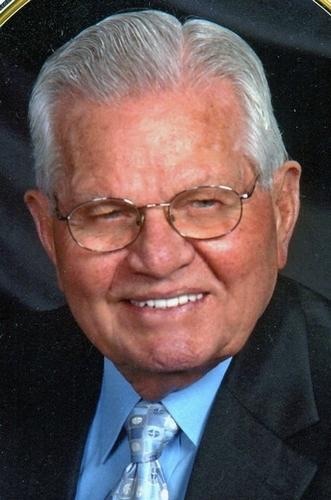 Graveside services for Thomas Ray McDonald, 95, are scheduled for 4 p.m. Saturday, April 18, 2015, at the Bomar Pt. Cemetery in Wilson with the Rev. Jason Williams officiating. Services are under the direction of Alexander Funeral Home of Wilson. Thomas was born July 14, 1919, in Ardmore, and passed away April 13, 2015, in Columbus, Ohio. He was preceded in death by his parents, Charles and Mary McDonald; brother and sisters, Joe McDonald, Augusta Beauchamp and Thelma Williamson; his wife of 64 years, Olline McDonald; and their infant daughter, Francis Rae McDonald. He is survived by his daughter, Edna Mae (Mark) Munden of Hemet, Calif.; sons, Thomas Ray (Pam) McDonald II of Durant, and Howard Fenton (Judy) McDonald of Pataskala, Ohio; seven grandchildren; 10 great-grandchildren; and four great-great-grandchildren. During WWII he moved from Oklahoma to Southern California to work in the shipyards. He served in the Navy for a short time and upon a honorable discharge established himself as an electrical contractor in Southern California. A dramatic change took place in his life when he accepted Jesus Christ as his Lord and Saviour. He was an active member of the North Long Beach Brethren Church where he and Olline served as deacons. They were a ministry team wherever they went. Sensing the leading of the Lord, he sold his electrical business in Southern California to serve in East Pakistan (now Bangladesh) in the construction of the Memorial Christian Hospital at Malumghat for the Association of Baptist for World Evangelism. Returning home he returned to the electrical trade. After a fall from a ladder he knew he could no longer do the manual work of an electrician he became a realtor. He retired to Oklahoma and served as a deacon at the Colbert First Baptist Church. During his retirement, Tom and Olline spent months living out of their motor home in Counselor, N.M. Tom supervised the construction of a gymnasium Grace Brethren Home Missions. Later Tom and Olline moved to Pataskala, Ohio, to become part of the Pataskala Grace Brethren Church where their son Fenton was pastor. He served the church as an elder until he was unable to serve because of health.